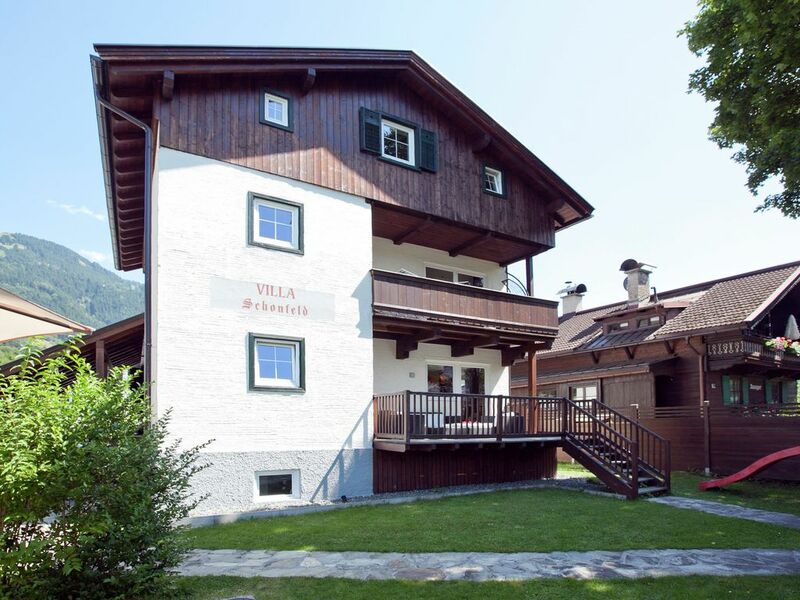 Villa Schönfeld está em uma posição única em Kitzbühel. Está apenas a 200 metros da Hornbahn e do pitoresco centro da cidade. A moradia está bem posicionada. Todas as instalações, restaurantes, lojas e estações estão a curta distância. Você não vai precisar do seu carro. A moradia foi completamente renovada em 2008 e o resultado é soberbo. A luxuosa casa de férias abrange o rés-do-chão e tem a sua própria entrada, pelo que a privacidade é garantida. O interior é atraente e tem todas as conveniências modernas. A nova casa tem três quartos espaçosos, uma moderna casa de banho e uma agradável sala de estar. As janelas francesas abrem para um terraço com deck virado para o sul. Há uma vista maravilhosa do terraço do famoso Hahnenkam e Streif. O jardim leva diretamente para o calçadão que leva você ao pitoresco centro da cidade. Kitzbühel é um paraíso para os caminhantes, caminhantes nórdicos, ciclistas de montanha e golfistas. É um destino de verão ideal. Leuk appartement, veel dingen te doen. Vriendelijke ontvangst. Goede handdoeken service. Appartment great for family of 2+4. Well situated just off central village with ski bus around the corner. We had a car which simplified grocery shopping but 15 min walk to supermarket. Owners very supportive and serviceoriented - never any problems. Despite the fact that the weather is not so meezat us, we do have a very pleasant time in Kitzbuhel. This was not due to the perfect accommodation at least. Even in rainy weather, we were able to sit out on the spacious covered terrace. The villa is five minutes' walk from the town center and shops and department stores are nearby. The rooms are spacious and very clean. The living room and kitchen were practical and cozy. The fact that the owners lived in the same building was certainly not a flaw. They were very welcoming, without imposing itself. On Also towels were well stocked. A must for anyone loves the mountains and still want comfort. The villa was superbly located only a 5minute walk into town and 5minutes to closest gonola. The interior was clean, modern and very cosy, the shower was fantastic and like a waterfall. The owners were always helpful and equally gave us the privacy when needed. Kitzbuhel is a great resort with stunning scenery and a fantastic lake to swim in. We would definitely return to the same location and villa. Thank you. Ouders, met 4 volwassen kinderen. Wij vonden het een prima accommodatie. Het huis ligt op loopafstand van de Hahnekammenlift. Erg volledig ingerichte keuken. Schoon! Uitstekende bedden. Enige minpunt voor ons dat er geen lekkere bank in stond. Stayed over New Year, apartment was really lovely, well appointed , warm and with everything we needed for 6 adults self catering for a week. Everything in good condition, beds and bedding lovely quality, towels changed midweek,plenty of room and very quiet. Basement has bootwarmer and plenty of storage for skiis and snowboards. Owners live above so are on hand for help and advice if needed but were not at all intrusive, and left a lovely welcome basket for us, a nice touch. Very convenient for Kitzbuhel, an easy 5 minute stroll to the beautiful town centre but also very conveniently there is a garage nearby with a small Billa supermarket for provisions when other stores were closed. Close to The Horn gondola and about a 20 min walk to Hannenkam lifts through town centre with ski bus stop just around the corner making access to large ski area very easy, also train station about 5 min stroll away . Local Tourist Office organises daily walks for free, just turn up, ski poles provided, very good. Town Centre has beautiful shops, lovely restaurants and plenty of bars and cafes, good for apre-ski.